Flocculation of sludge in the dewatering process is required for efficient wastewater processing. 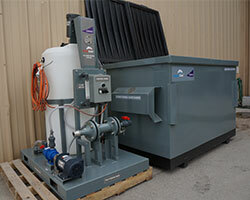 The PolyCat™ is an improved batch-type blending and injection system compared to traditional polymer mixing systems. The PolyCat’s green design uses less energy and less polymer per pound of sludge treated. More efficient dewatering with the PolyCat, also means less emissions inherent to solid waste transportation and disposal, saving valuable landfill space.